Elafonisi itself is actually an island which is connected to mainland Crete via a sandbar. 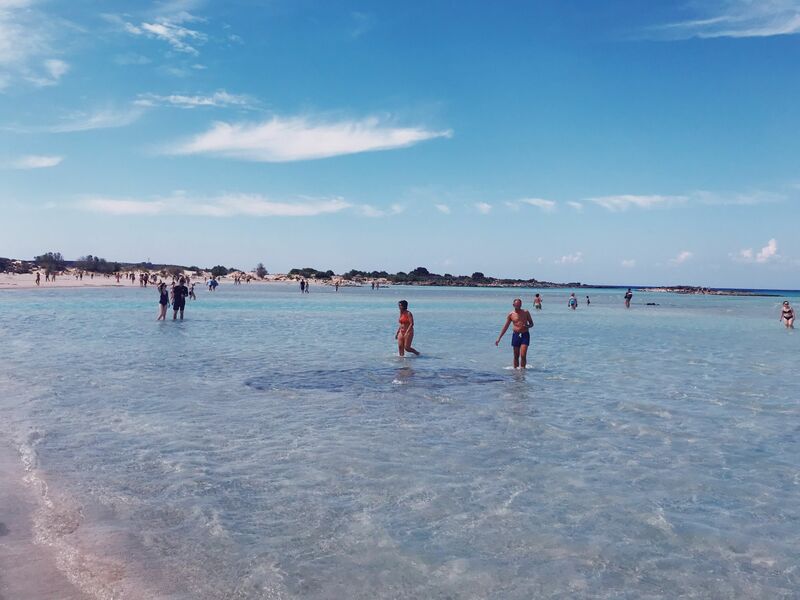 Even at high tide, the sandbar is only submerged by around a meter of water, meaning that you can wade out to the island (which is actually an internationally recognised nature reserve) at any time. 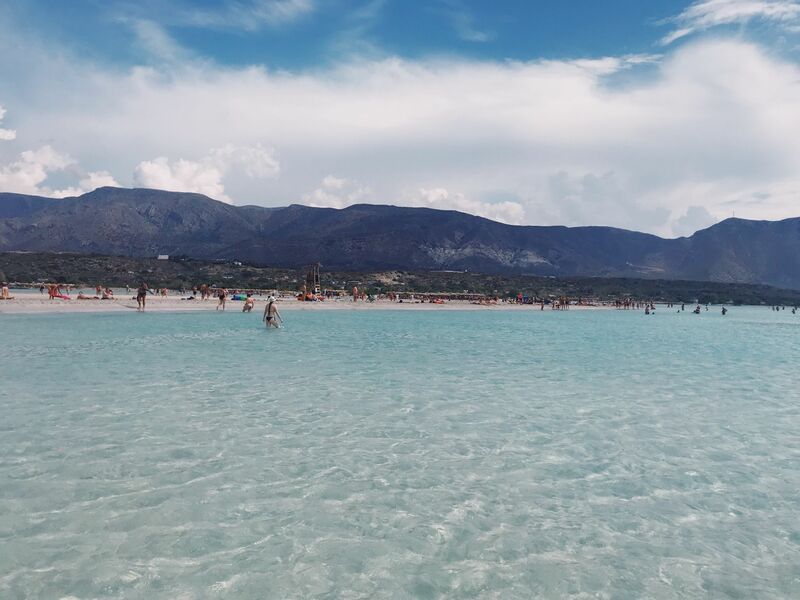 What’s so special about Elafonisi Beach? 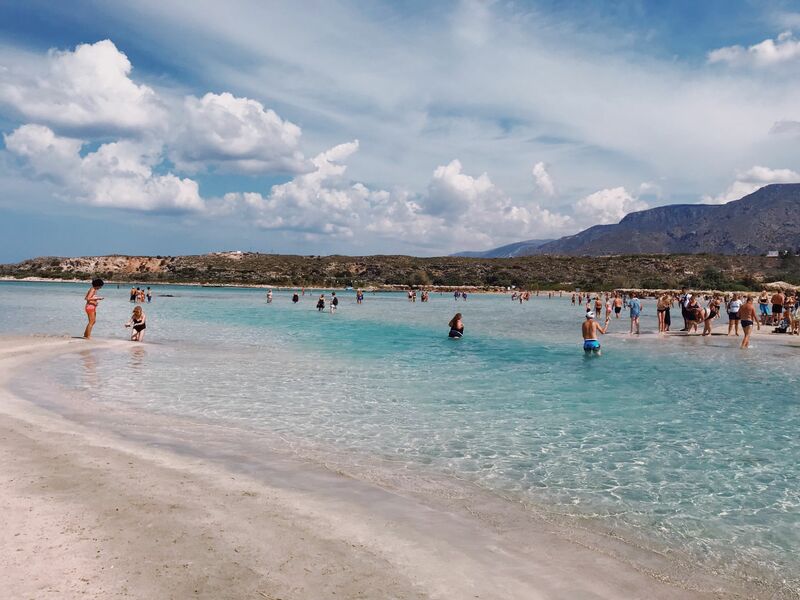 There are hundreds of Crete Beaches so what exactly makes Elafonisi so special? Well For one its a nature lovers paradise as its home to 110 plant species, many of which are very rare. Most notable is the Androcymbium rechingeri which is found nowhere else on the planet. Top Tip: there are several paths on the island which you should stick to when exploring to avoid damaging any precious plants. More than this, the shallow lagoon that surrounds the island is a safe haven for the rare Loggerhead sea turtle. However, these turtles are very shy so you would be lucky to see one! 1. PINK SAND: The remains of pink seashells wash up along the edges of the lagoon and along the sandbar, creating the illusion of a pink beach. Due to things such as the wind and the tide, you sadly won’t always find the beach to be pink. But if you do it’s spectacular! 2. THE SOFTEST SAND: the areas of the beach that aren’t pink are instead filled with the whitest and softest sand that wouldn’t be out of place in the Maldives. 3. BEAUTIFUL WATERS: The water in the lagoon that surrounds Elafonisi beach is some of the clearest I’ve ever seen. What’s more its shallow, warm and teaming with fish, making it perfect for families. The part of the beach nearest the mainland is the most concentrated as its filled with deckchairs and umbrellas. But, if you cross over the sandbar to the island then there are many secluded spots where you might even be able to find a private outcrop. More than this, if you visit early in the morning/later on in the evening you’ll still be able to enjoy the Islands fascinating rock formation and pink sand in relative peace. Part of the reason Elafonisi Beach remained undiscovered for so long is its remoteness. The beach is located quite far away from any major towns meaning its relatively difficult to reach. Most routes to the beach take you along narrow and winding mountain roads. While the scenery is breath-taking, it’s not the best drive for nervous drivers! 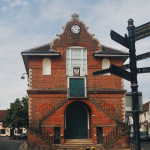 An alternative to driving is taking a coach tour. As Elafonissi beach has increased in popularity, more and more companies have arranged day tours. Therefore you’re likely to find frequent coach tours to Elafonisi from most major towns in Crete. SIDE NOTE: although taking a coach may be easier, this does mean you’re likely to arrive at the beach at its busiest time! Despite its increasing popularity, locals have tried to keep Elafonissi Beach as ‘natural’ as possible. This means that there are fewer facilities than you might be used to. This said, there are toilets and two small outdoor restaurants that provide light meals and refreshments. 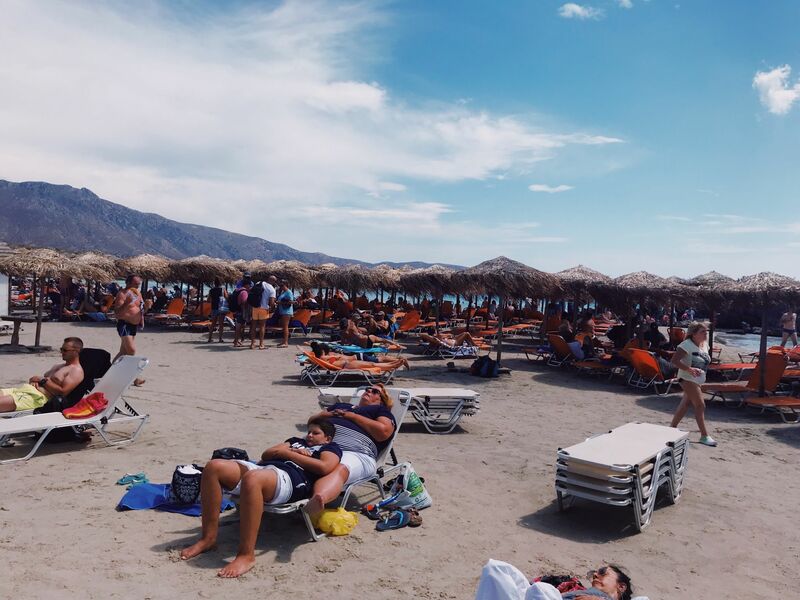 Further, as I mentioned above, a section of the beach is kitted out with sunbeds and umbrellas (although I really would avoid this area if you want to experience the true magic of Elafonisi Beach). There are also lifeguards stationed across the beach in the summer months. So that complete’s my guide to Elafonisi Beach Crete. 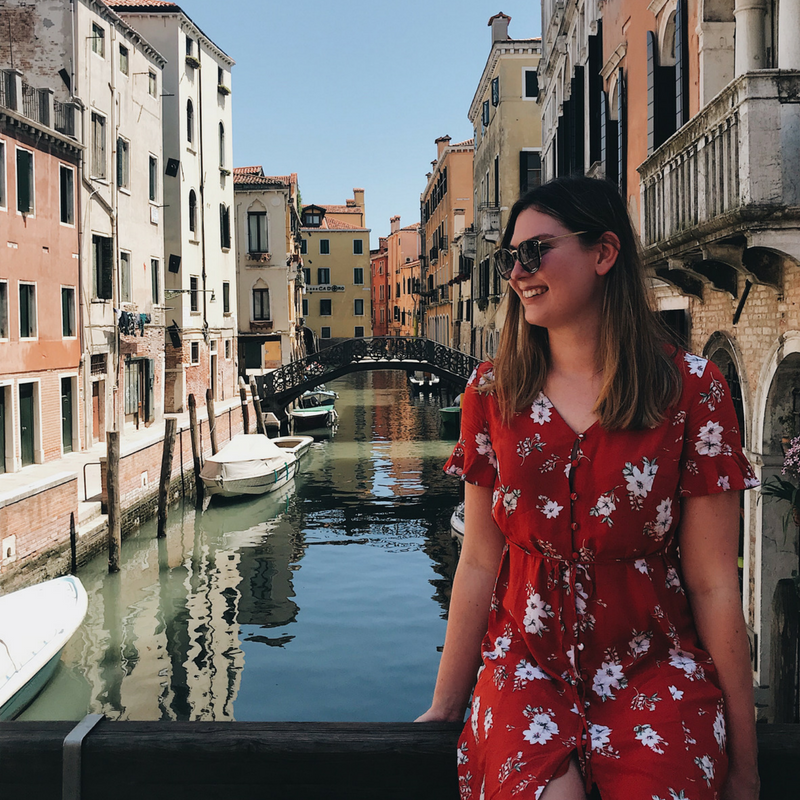 It really is one of the most stunning beaches I’ve visited in Europe! I only hope it manages to remain so pristine. So while I highly suggest visiting this stunning destination, I urge you to be mindful of its delicate environment when you do! Oh man, this sounds like a little piece of paradise. I have heard about pink beaches around the world like this one and the one in the Bahamas, but have yet to set my eyes on them. I can imagine they are so amazing! Thanks for introducing me to a new one! How dreamy does this place look?! ♪ Let’s go to the beach-each, let’s go get away!♫ Amazing post, saving for future reference! 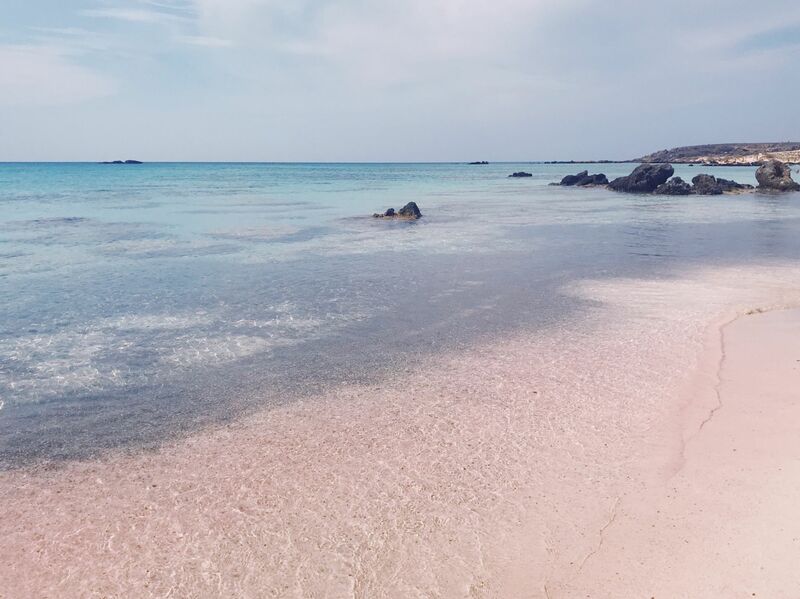 Man Greece has it all – red sand beaches, white sand beaches, black sand beaches and now pink sand beaches! I really need to go back just to relax on this beach! 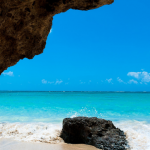 Wow – what a gorgeous beach! Greece is on my list for sure and this looks amazing. The pink sand reminds me of Bermuda, also gorgeous! The idea of the turtles and fish and plant life is what I would love most. I wouldn’t want to be cramped with all the people so if we go, I would definitely try to steal away to a more secluded area. I hadn’t heard of this beach so thanks for your sharing! I visited Greece many many years ago, and I’ve always wanted to go back. Crete has always been on the top of my return to Greece list, and now I will add this little piece of paradise. I hope the Greeks are better at looking after their beaches than most SEA countries. Thailand’s Maya Beach comes to mind. I have never heard of this place, but wowww it’s stunning! The blue waters and pink sand! I’ve never seen anything like that. Bookmarking this article and putting it on my list for sure. I haven’t heard of Elafonisibefore even if I might have seen pics of this pink beach. I will definitely try to go there in late spring hoping that it would be less crowded than in other warmers, hotter months. Thanks for the precious info, especially the one regarding the flora. Wow Elafonisi island looks beautiful completes with pink sands its amazing, I haven’t heard it before. Its definitely added on my list whenever I will revisit Crete.